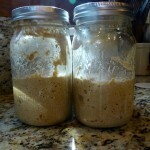 I believe that these Sourdough English Muffins are reason enough to maintain a jar of sourdough starter in your fridge. They are not super difficult to make, but they do take a little bit of time and love. But they are so delicious and so much healthier for you than the store bought version. Once you get spoiled with homemade breads, it really gets hard to go back to the mass produced stuff. Like most sourdough recipes, you’ll need to do a little planning for these muffins. You’ll make your dough the night before and it should rest in the fridge overnight (8-12 hours). Make sure you put the dough in the fridge during the rest period. If you leave it on the counter, they won’t have any rise left in them for baking and you’ll end up with hockey pucks. And along that line, be sure to use instant yeast in your recipe. I use SAF red instant yeast – it has a different lifespan that the normal quick rise yeast that you typically find in the grocery store. the quick rise will die off by the time your long rise is over and you’ll end up with the hockey puck problem again. In the morning, you pull the dough out of the fridge, shape your muffins, and “bake” them off. You could also start the process in the morning and finish off that evening – but you’d loose the beauty of fresh English muffins for breakfast. And, really, what’s the point of that? Once you pull the muffins out of the fridge, I divide the dough into muffin sized portion. The engineer in me always weighs each portion to make sure they are all about the same size. Normal people probably don’t do this. But, I find that 1.7 ounces of dough makes a nice, small muffin that is still big enough to hold an egg sandwich. 2 ounces is a medium sized muffin and 2.3 ounces would be a monster size around our house. When I do 1.7 ounce portions, I usually end up with about 2 and half dozen muffins. Once I have the dough portioned out, I shape them into flat rounds. This is one of the best parts of the recipe. There is just something about handling a nice bread dough. Place the rounds onto a parchment lined baking sheet. You can sprinkle course ground corn meal or semolina on the parchment so you have a little crunch to your final muffin. It is a nice touch, but my corn meal usually ends up burning on the cast iron skillet. I guess its a little give and take that way. And speaking of baking, English muffins aren’t really baked. They are cooked on the stovetop – kind of like tortillas. I cook mine on a cast iron skillet. They will puff up as they hit the heat and it’s a pretty fun thing for the kids (and grownups) to watch. Sometimes mine brown too quickly and aren’t quite done in the centers. If that happens you, can finish them off in a 350 degree oven for about 10 minutes until the centers reach 190 degrees. I don’t really ever stress about the centers being done. I usually end up splitting most of the muffins and freezing them. When I’m ready to eat the muffins, I toast them – so the centers get finished that way. 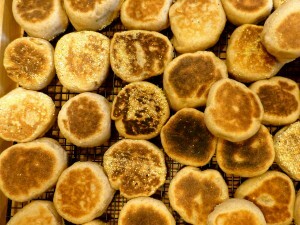 As written, this recipe for English Muffins does not rely entirely on the sourdough to give the rise to the muffins. It is kind of a cheater recipe for sourdough. Which makes it a great recipe for anyone who is just starting out with sourdough and is working at gaining confidence in their skills. If you want to convert it to 100% sourdough, then you should 1) make sure your starter is fed and active and 2) eliminate the instant yeast and optional citric acid. I hope you enjoy these sourdough English muffins! As with all things whole wheat, if you aren't using freshly milled whole wheat flour, you can substitute a high quality store a combination of ½ store bought white whole wheat flour and white flour, but your final product will be slightly different than mine in taste, texture, and nutrition. 7-8 cups white whole wheat flour - freshly milled flour strongly recommended! Combine all ingredients, except, flour and semolina, in the bowl of a stand mixer. Add flour until dough is soft and at the right consistency for kneading. If using a Bosch universal, you should add flour until the dough just cleans the sides of the bowl. If using an Ankarsrum the dough should pull from the sides of the bowl and form a donut around the kneading arm. The dough can be a little sticky - it will continue to absorb moisture as it rises. Knead using the mixer for 6-12 minutes (Bosch or Ankarsrum mixers will need 6 minutes while other mixers may need 12 or more minutes) until the dough is smooth and slightly tacky. Oil dough, place in bowl and cover with plastic wrap or lid. Refrigerate over night or 8-12 hours. About 1-2 hours before you are ready to make muffins, take dough out of fridge and let come to room temperature. This step can be skipped, if you don't have time. 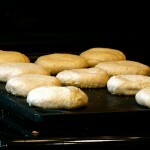 Portion dough out for muffins (1.7-2.3 ounces, depending on size preference) and shape into flat rounds. Warm cast iron skillet on stovetop to a low or medium low setting. Rest muffins on a cookie pan coated with course ground semolina. Cook muffins in pan about 5 minutes each side until dark brown. Internal temperature should be 190 degrees. If the muffins brown before being done, they can be finished in a 350 degree oven for 10 minutes on a baking sheet. Split using a fork. Extra muffins freeze perfectly and are perfect for toasting for breakfast.